In 1947, Milton Caniff — creator of the adventure cartoon strip “Steve Canyon” — was honored as the first “Cartoonist of the Year” by the newly created National Cartoonist Society. His award was a silver cigarette box, engraved with artist Billy De Beck’s “Barney Google and Snuffy Smith” characters. 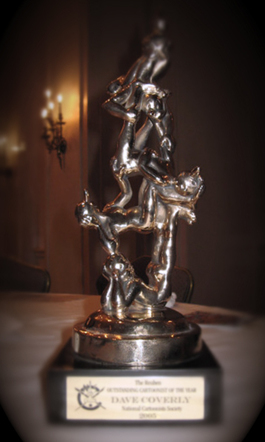 Seven years later, the Reuben Award was introduced, and to this day it is the highest honor the profession bestows when recognizing the outstanding cartoonist of the year. Past winners include Al Capp, Charles M. Schulze, Johnny Hart, Bill Keane, Bill Watterson, Gary Larson, Gary Trudeau, Matt Groening, Greg Evans, and Bill Amend, to name a few. 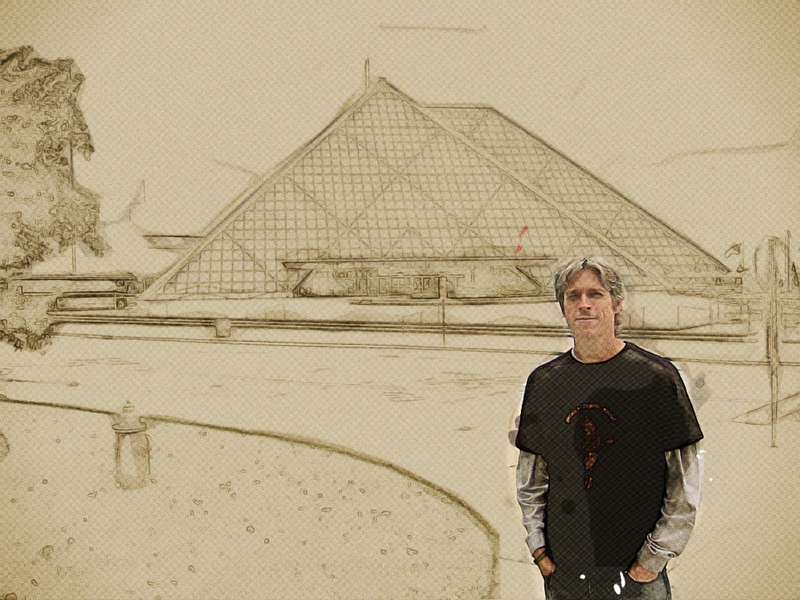 Dave in front of the Rock n’ Roll Hall of Fame in Cleveland, Ohio. And the award goes to… Dave Coverly! This year, I am excited to report that the prestigious and highly coveted Reuben Award for Outstanding Cartoonist of the Year went to my friend and honorary Druidiot since 2005, Dave Coverly. After being nominated for the past four years, Dave and Speedbump edged out Dan Piraro (Bizarro) and Stephan Pastis (Pearls Before Swine) this past weekend in L.A. to win the NCS’s top award, and join the ranks of an amazing group of artists. Congratulations, Dave! In honor of this well-deserved achievement, “Speedbumps” is the Happy Medium Song of the Day; an apropos tune by one of Dave’s favorite bands, Luna.